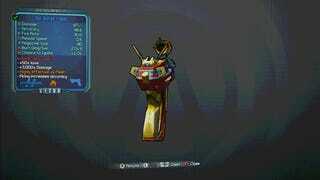 What's the most badass weapon you've seen in Borderlands 2? But this little guy burns enemies to death and therefore rarely needs more than one or two shots on enemies equal to my level. It's also pretty nice looking. Then there are the more rare weapons and the, um, Mad Moxxi variety of weapons. Readers, show us the most badass weapon you've come across in your playthroughs of Borderlands 2.